This time of year can be beautiful but winter weather hazards are lurking. Be aware of the dangers and take precautions. Here are just a few threats to avoid. A sneaky winter weather hazard is black ice. Because black ice is highly transparent and difficult to see, it makes driving or walking on affected surfaces extremely dangerous. Lack of traction opens up the possibility of slipping and falling or being involved in a car accident. to minimize the chance of black ice forming, be proactive. 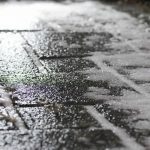 Application of an anti-icer, such as liquid brine, is an effective way to help keep roads, parking lots, sidewalks and steps safe. if ice has already formed, de-ice with the appropriate ice melt product for the surface and air temperature. Cope Salt has a wide range of products in stock, ready for pick up or delivery. Four factors contribute to cold stress: cold temperatures, high or cold wind, dampness and cold water. Cold stress often strikes as hypothermia or frost bite. Hypothermia occurs when body heat is lost from being in a cold environment faster than it can be replaced. Symptoms begin with shivering. As the body temperature continues to fall, slurred speech, lack of coordination and memory loss develop and shivering ceases. Once the body temperature falls to around 85°F, the person may become unconscious, and at 78°, the person could die. Frostbite occurs when layers of skin tissue freeze. In sever cases, amputation of the frostbitten area may be required. Frostbite can be caused by exposure to severe cold or by contact with extremely cold objects. In fact, frostbite occurs more readily from touching cold metal objects, such as tools, because heat is rapidly transferred from skin to metal. Frostbite typically affects the extremities, particularly the face, ears, fingers and toes. Initial symptoms vary, but typically include skin that looks waxy and feels numb. Once damaged, tissues will always be more susceptible to frostbite in the future. Prevention is the most important defense. Wear appropriate clothing and be aware of how your body is reacting to the cold. Avoid alcohol and smoking to help minimize risk. Believe it or now, icicles can be a deadly winter weather hazard. Fifteen people per year are killed in icicle related accidents. Icicles don’t have to fall from tall structures in order to cause damage. 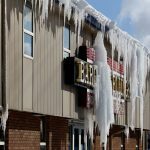 Icicles detaching from two-story homes or multi-story building can cause lacerations, head injuries, broken bones, and death in rare cases. In addition, dripping water from melting icicles may pool on the ground below and refreeze, creating a slip and fall hazard. Besides the risk of injuries, large icicles falling with force can cause significant property damage. The risk of being hit by falling icicles is greatest when the wind is strong and when the sun is shining directly on the icicles which can partially melt and loosen them. Slips, trips, and falls make up the majority of industrial accidents. The number of incidents increase in snow and ice season. Injuries can be costly for individuals and companies. Take a few preventative measures to avoid these winter weather hazards. 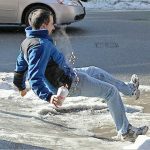 Wear proper footwear when walking on snow or ice. A good tread is extremely important. Take short steps and walk at a slower pace so you can react quickly to change in traction. Keep your hands out of your pockets when walking. Use them to maintain balance. Contact us for more information on minimizing winter weather hazards.